This new season, love has found its way into the dishes served at Jamie’s Italian with a refreshed menu of delicious food prepared using fresh and flavourful ingredients. For starters, we had the crostinis which are open-top sandwiches ($15++) with a variety of toppings on toasted bread. Fresh ingredients are used for each type of crostini such as fresh crab with smashed avocado, balsamic roasted cherry tomatoes and salami with ricotta, just to name a few. It’s just about to get juicier with the crispy mushroom fritti! Squeeze the slice of lemon and dip the crumbed portobello into their garlicky mayo for a finger-licking good experience! 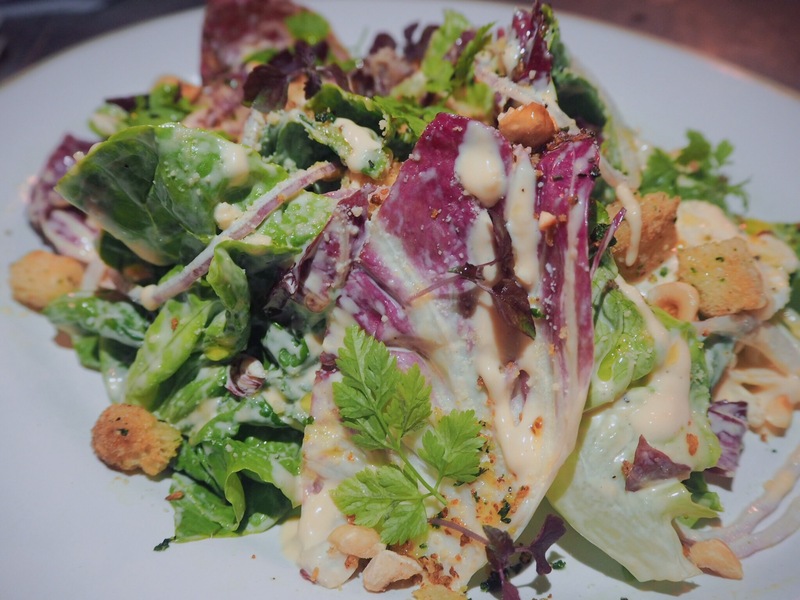 There’s something special about their JI Caesar Salad ($9.00++) and that’s the toasted hazelnuts which constitute its crunch. Also, the greens (and reds) like the red chicory were really crisp and naturally sweet, a refreshing starter to have before the carbs and truffle-loaded meal. Try the melt-in-your-mouth Truffle Ravioli ($26.50++)! Freshly minced black winter truffle with butter and parmesan wrapped in Italian dumplings and served with shaved truffle and creamed sauce. This is great for sharing as it might be a tad heavy if you’re having it all on your own, besides, there are more that you need to save your stomach for! 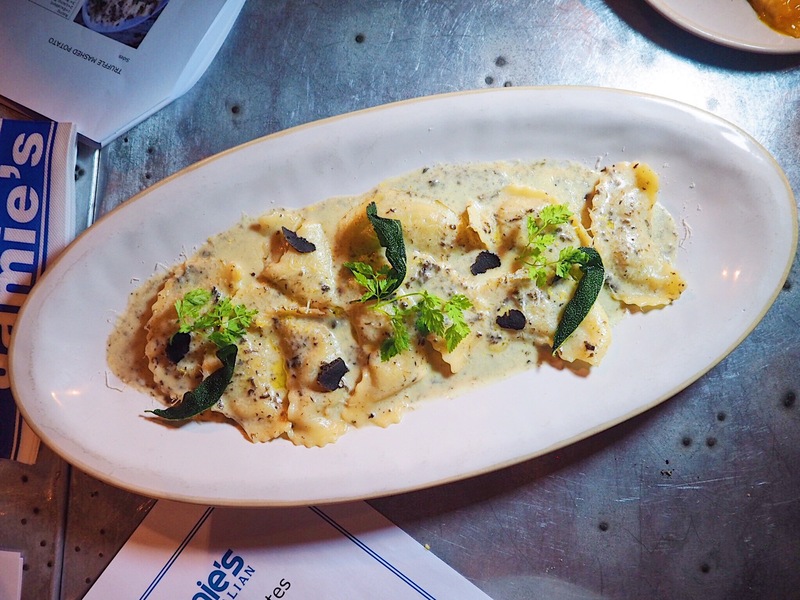 Note: The Truffle Ravioli is only available at Jamie’s Italian Forum. 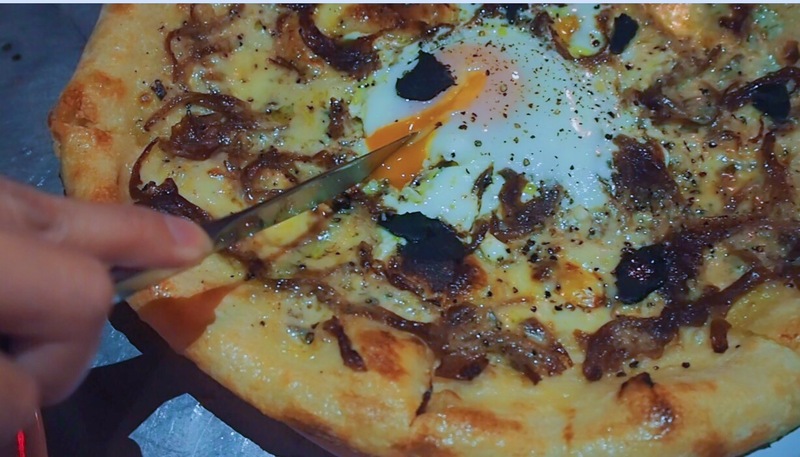 For the Truffle Shuffle Pizza ($26.50++), the exciting part has to be the cutting of the molten egg for the yolk to ooze out so that you can spread it over the pizza. The other highlight would be the sweet and balsamic onions atop the truffle-infused creamy bechamel sauce. Little did I realise how terrific the combo of balsamic, onions and truffle could be. It was a marriage of tanginess and fragrance from the truffle. All would have been great if the pizza base was thin-crusted and crispier too! A personal favourite of mine, but may not be for those who do not fancy their chillies. Penne Arrabiata ($16.50++) has a fiery red that comes from the chillies and tomatoes. A healthy choice for the health-conscious since all the ingredients used are nutritious. Extra virgin oil, garlic, parmesan, basil are the other ingredients that goes into this beautifully plated pasta. If you’re wondering what that is on the spoon, I’m telling you it’s pangrattato. No worries if you have never come across that because it’s new to me too. However, when I found out what it actually is, I was like wow did not know breadcrumbs actually has another name. Yes, Italian bread crumbs can bring the pasta to a whole new level. If you’re looking for a spicy kick, this penne arrabiata has all it takes. Are you ready for some 280g Rib Eye Steak ($46++)? 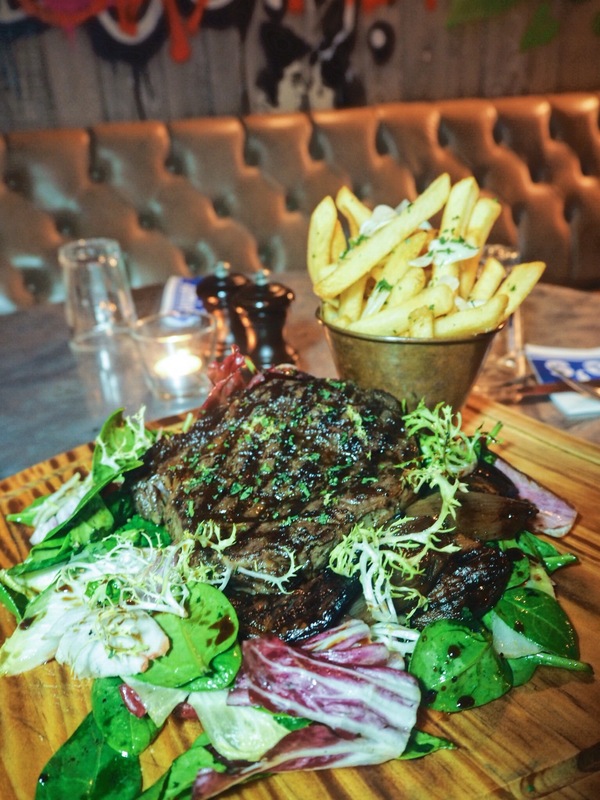 Served on a bed of balsamic salad, grilled and juicy portobello mushrooms and not to mention, the chunky-cut chips with cheese shavings. Gremolata garnish spread over the medium-rare steak definitely gave it some zest, and carried well with the smokiness of the rib eye steak. Altogether, this was a heartening secondi. Yumz. Along in their new menu, they also have others such as Truffle Flatbread ($10++) and Truffle Mashed Potato ($7.50++) which I did not manage to snap some pictures of. I am looking forward to my next trip where I can have my truffle and eat it too! Check out also their super lunch and dinner main course deals. For lunch, enjoy 2 main courses for $24.90++ ONLY! Whilst dinner sets you back at $39.90++. What are you waiting for? See you there!